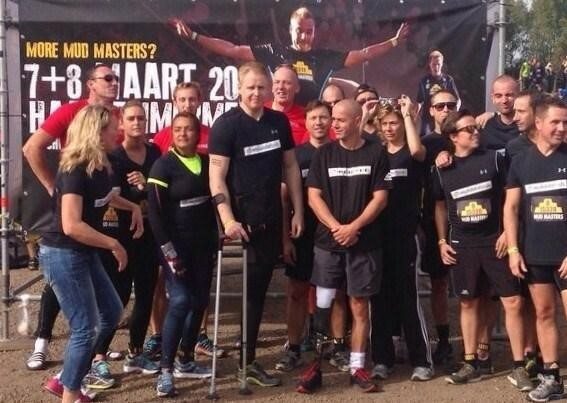 With the encouragement of my Innovairre Communications colleagues, I recently had the opportunity to participate in the Mud Masters 12K Obstacle Run in the Netherlands. I ran to support “Revalidatie fonds” (Rehabilitation Fund), a charity that assists and trains children and adults with disabilities. The Mud Masters race is run on an obstacle course devised by Marines, with 20 obstacles including running on mud hills, climbing and jumping from two- and three-meter walls, crossing a channel with a rope, navigating through trenches, high-diving, and much more. Rehabilitation Fund focuses on creating a society without barriers to education, work, housing, leisure, or transport for children and adults with disabilities. Some of my colleagues at Innovairre donated to Rehabilitation Fund in support of my participation in the event. I am grateful not only for their donations but also for their kind encouragement. Actually, I had broken my feet in February 2014 in a sport accident, and completing this obstacle course was a great challenge to me: to keep my focus on the goal of exceeding the physical limits and not on the pain. As you can see from the photo and the video, others on Team No Limits had rather extraordinary challenges that they were determined to overcome. Finally, I finished my 12K in 1 hour and 44 minutes, which is not that bad, when you have 20 obstacles like these! Next year, I will certainly go for a new challenge: the 18K Mud Masters Obstacle Run. Among the programs the Rehabilitation Fund provides are research and innovative rehabilitation methods and techniques for spinal cord injuries; the use virtual reality training to simulate real-world environments during gait training for people adjusting to prosthetic devices; job training and placement; special programs for the visually impaired; and interactive tools for children with cancer. Emmanuel Pontus is a project manager in the Netherlands office of Innovairre Communications, which helps more than 500 nonprofit organizations around the world. To learn more, contact us at Answers@Innovairre.com.